February is National Pet Dental Health Month and it's a perfect time to brush up on your dog's dental care routine. Besides brushing your dog's teeth, you can give them chews that will help remove plaque and freshen their breath. 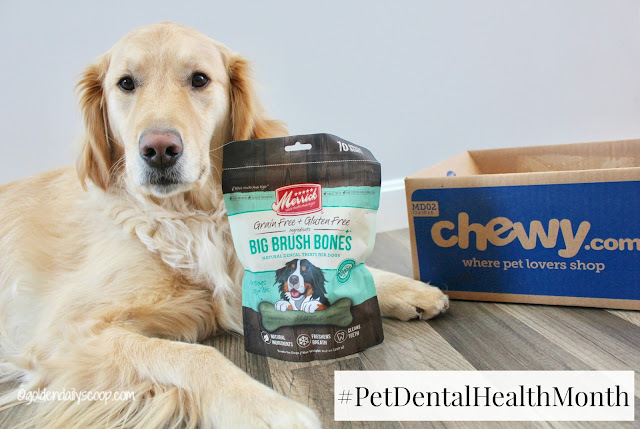 Chewy.com offers a wide variety of dental chews for dogs and this month they sent us a package of Merrick Big Brush Bones to try out. 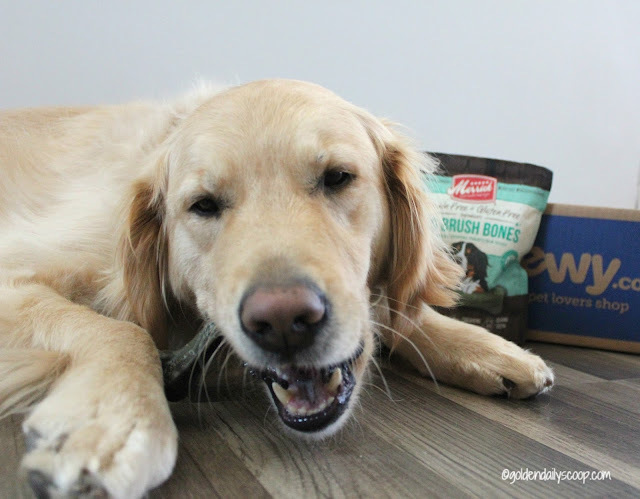 As a Chewy Influencer, Golden Daily Scoop received a bag of Merrick Big Brush Bones from Chewy.com in exchange for an honest review. 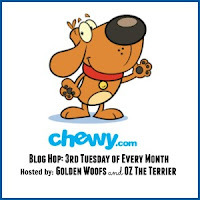 We received no compensation and Chewy.com is not responsible for the content of this post. I try and do my best brushing the dog's teeth with a toothbrush and paste but in addition to that I do like to give them dental chews and bones. 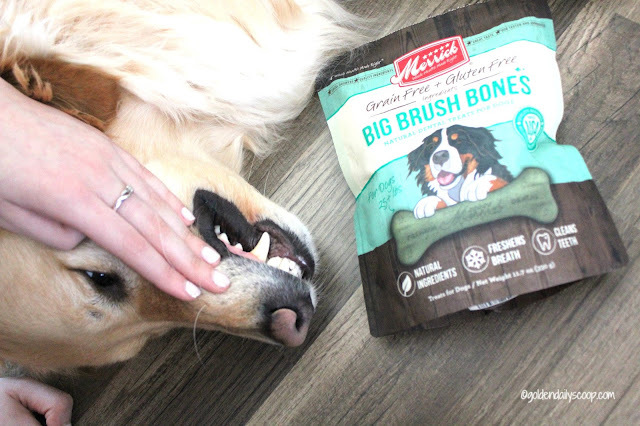 Merrick Big Brush Bones are all-natural dental chews made of natural ingredients that freshens their breath, cleans their teeth and are easily digestible. Bruin couldn't wait to get his chomps into the bone. 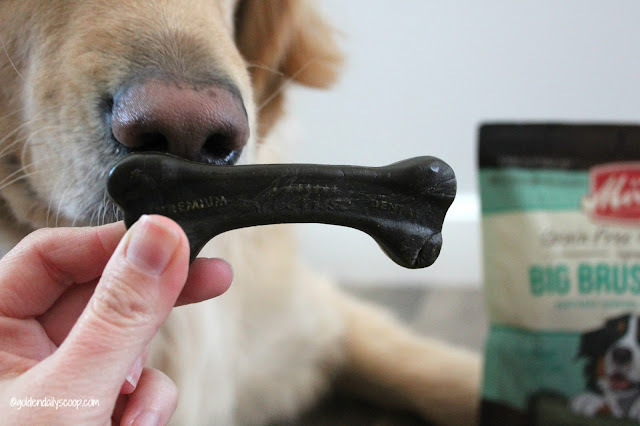 Often I find dental chews to be a bit small for the Goldens and they end up eating them quickly like a cookie rather than chewing on them to get the cleaning done but these bones are a perfect size and texture. The Merrick Big Brush Bones are just that, BIG and are made for dogs 25+lbs. Unlike most dental chews, these are grain free and gluten free and are safely made in the USA from local growers with quality ingredients. 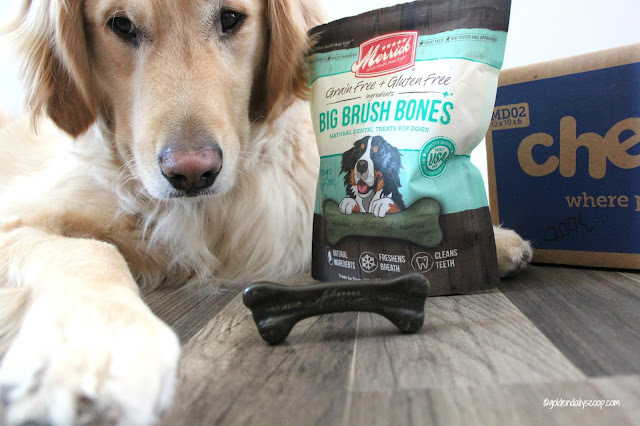 Their innovative shape and texture helps remove plaque and tartar and their tasty chicken flavor will make your pup think they are just getting a tasty treat. I was happy to see Bruin really chewing on the large bone, getting his back teeth where it's hard to reach. It is recommended to give your dog one brush bone daily and as with all dog chews, observation is always recommended. I always find the dogs are thirsty after having their bone, so I suggest making sure they have plenty of water afterward. 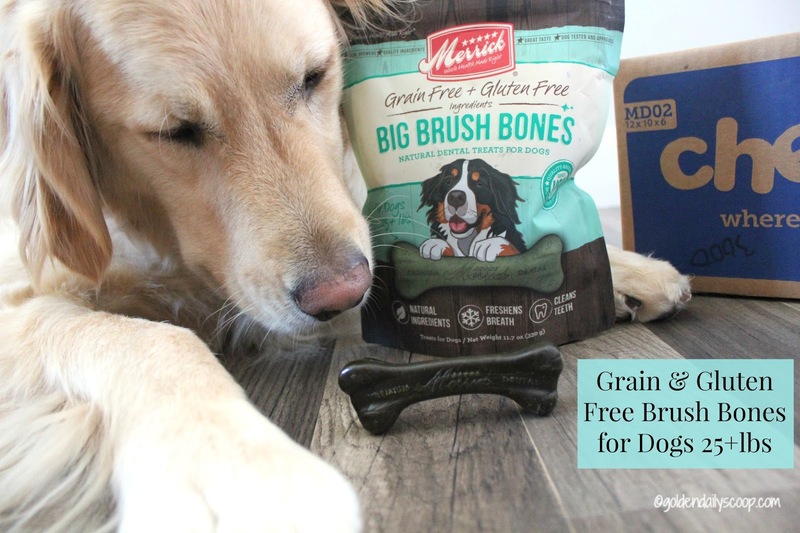 We will definitely be adding Merrick Big Brush Bones to the dog's dental routine, they love their tasty flavor and I love knowing that along with a treat, they are getting a great dental cleaning! We are joining the Chewy.com Blog Hop hosted by Golden Woofs and Oz the Terrier. Magical-Dawg adores dental treats! We'll have to look into these to keep his teeth in shape. Thanks for sharing! What flavor are they? Dental chews are such a great idea, but the flavor totally matters. These do look good though! Good dental care is so important. Chewy.com has so many fun items. Thanks for the review. Kilo loves chews and they really relax him. Fantastic if I find ones that help clean his teeth and give fresh breath as he is not a fan of teeth cleaning or vets. These sound like great dental chews. I bet our dog would love them! As for brushing duty, that falls to my husband. It is part of our routine for Eddie, much to his dismay, I'm sure. My dogs love dental chews. As a matter of fact my foster doggie is sitting next to me, loving her chew. It's a great addition to a dog's overall dental care plan. Hurrah for dog chews! It's nice that Chewy recognizes that dogs come in all sizes and provides chews to match. We give our dog chews but also brush his teeth with doggy toothpaste. Maybe this is a great chew to get for my mom's dog. His digestive system doesn't do too well with some of the more popular teeth cleaning chews. Things that clean the teeth are good! Mr. N has dental health issues so we brush his teeth and have chews scattered around the house. My crew all get dental chews/treats daily. April had a dental cleaning earlier this month, thankfully no major issues. I'll check these chews out, the Poodle Pair can never have enough chews, they think! I love hearing about all of these no-brush options for teeth health in pets! Brushing a cat or dog's teeth isn't easy, so having options like these chews is always great! Thanks for the wonderful review. My dogs love dental chews. These sound perfect since they are grain free and made in the USA, I'll have to see if they have small ones! Bruin has Hollywood white teeth, he's a great spokesdog! Sounds like your dog really loves these chews. I always wonder, though, if chews really do any good for cleaning teeth.